Figure 1. The 19 polar bear subpopulations, with the Western Hudson Bay region marked. Modified from map provided by the IUCN Polar Bear Specialist Group. Figure 2. Map (from Stirling et al. 2004: fig. 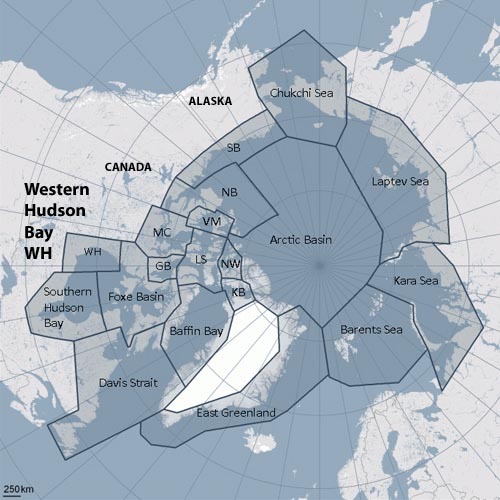 1) showing the boundaries (dotted lines) between the polar bear subpopulations that live in Hudson Bay: WH, western Hudson Bay; SH, southern Hudson Bay (which includes James Bay); FB, Foxe Basin. The map also shows the average time of sea ice breakup – 50% ice or less – for the various areas of the bay (average of 1971-2000). 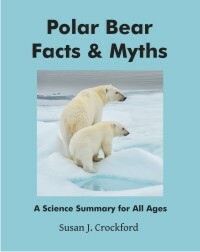 1) WHB polar bears routinely experience the longest summer fast of any population. The annual ice on Hudson Bay is usually completely melted by early August, which means WHB bears go four months or more without feeding, every year of their lives. Pregnant females don’t return to the ice at freeze-up but make a den onshore to hibernate over the winter. In their snug dens, females live off their fat for another four to five months, while they give birth to 1- 4 tiny cubs and then nurse the newborns. In spring, mothers and cubs emerge from the den (usually sometime in April) and soon after, the family heads to the sea ice to gorge on newborn ringed seals. 3) Before 1985, most WHB females weaned their cubs at 1.5 years, during their second spring, after which they are available to mate again. This means that many WHB cubs that were 1.5 years old were on their own (so-called “independent yearlings”). Even so, it was found that “cubs that are weaned as yearlings in western Hudson Bay were no heavier than were yearling cubs in the northern populations, virtually none of which were successfully weaned.” (Ramsay and Stirling 1988:625). Therefore, WHB cubs that were weaned at 1.5 years were not in better condition (fatter) than cubs in other populations that were not weaned, suggesting WHB cubs were not weaned earlier because they were larger or better fed. 4) Despite most WHB females weaning their cubs at 1.5 years before 1985, “their cubs appeared to have similar or even lower rates of mortality“ than cubs in northern populations” (Ramsay and Stirling 1988:626). “In the early to mid-1980s, the natality [cub production] of female polar bears in western Hudson Bay was the highest recorded anywhere in polar bear range, and nowhere else did females successfully wean cubs at 1.5 years of age instead of at the normal age of 2.5 years. 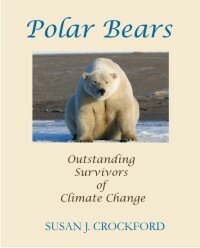 Subsequently, a long-term decline in condition of adult female polar bears and survival of their cubs was documented from the 1970s through the late 1980s (Derocher & Stirling 1992), as reflected by a significant decline in condition indices. So, before 1985, many WHB bears had larger litters and weaned them at a younger age, all while fasting every summer for the longest time of any population. Derocher (1999) found that latitude (i.e. a north to south cline) did not explain this difference among populations. By 1992, things had changed: more cubs in WHB were weaned at 2.5 years than at 1.5 years and independent yearlings were “uncommon” (Derocher and Stirling 1995:1661). However, while the condition of females and survival of cubs in WHB declined between the 1970s and 1985, the rate of triplets did not change and cub production was still higher than anywhere else in the Arctic – see fig. 3 below. Figure 3. Incidence of twins and triplets among western Hudson Bay (WHB) and southern Hudson Bay (SHB) subpopulations (left of the center bar), compared to other northern regions (Svalbard in the Barents Sea, Wrangel Island in the Chukchi Sea, “Northern Regions, Canada,” subpopulations not specified. Data from references in square brackets [#] below. But the documented decline in cub survival and condition of females documented above occurred between 1985 and 1992 – what about now? I’m going to save that question for a separate post because it reveals some issues that deserve star billing, not buried deep within this essay. It should be up in a day or so. 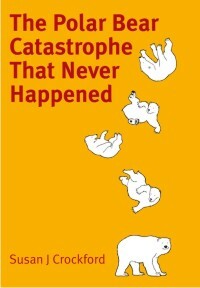 And then, in Part 2 of this essay, I will explore the possibility that rather than responding to the effects of global warming, western Hudson Bay polar bear numbers may simple be returning to ‘normal’ after a period of natural population rebound that was a response to the intense over-harvests that occurred between 1890 and 1930, discussed here, and again from 1950 to 1968 (when WHB polar bears are known to have been “harvested extensively,” including many females with cubs (Derocher and Stirling 1995:1662). This is not a new suggestion (e.g. 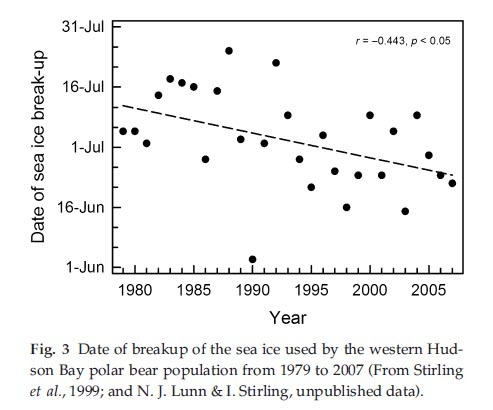 Derocher and Stirling 1995) but is one that seems to have been abandoned in favor of blaming slightly earlier spring breakup of sea ice on Hudson Bay in a few of the years since 1985 (see fig. 4). Figure 4. This is figure 3 from Stirling and Derocher (2012: 2696). Note that “Stirling et al. 1999” (cited in the original caption) report sea ice breakup data to 1998 only, even though the graph goes to 2007 – and even though it is now 2012. Note the large range of variation from one year to the next, rather than a steady decline since 1985. Amstrup, S.C. and Wiig, O. (eds.). 1991. Polar Bears: Proceedings of the 10th meeting of the Polar Bear Specialists Group IUCN/SSC, Oct. 25-29, 1988, Sochi, USSR. Gland, Switzerland and Cambridge UK, IUCN. Derocher, A.E. and Stirling, I. 1995. Temporal variation in reproduction and body mass of polar bears in western Hudson Bay. Canadian Journal of Zoology 73:1657-1665. Ramsay, M.A. and Stirling, I. 1988. Reproductive biology and ecology of female polar bears (Ursus maritimus). Journal of Zoology London 214:601-624. Derocher 2005. Population ecology of polar bears at Svalbard, Norway. Population Ecology 47:267-275. Uspenski, S.M. and Kistchinski, A.A. 1972. New data on the winter ecology of the polar bear (Ursus maritimus, Phipps) on Wrangel Island. Bears: Their Biology and Management, Vol. 2, pp. 181-197. 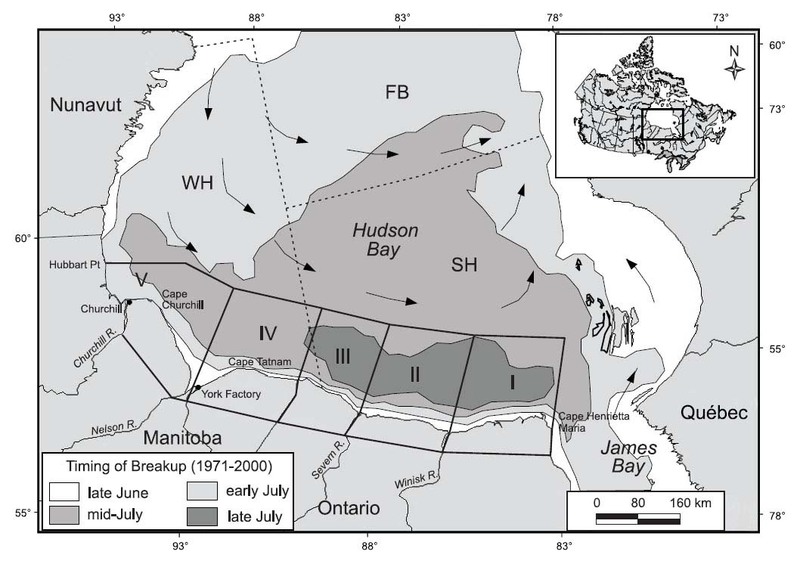 This entry was posted in Life History and tagged Hudson Bay, Hudson Bay breakup, triplets. Bookmark the permalink.